This is how every tyrant, every scoundrel, every bully, becomes powerful. They manipulate, they push the limits, in order to further the indulgence of their twisted ideas. Sometimes it is the evil urges of people like Dr Nasser. Sometimes it is the need for power. Sometimes it is the need to destroy that which threatens the world view of those who need to retain that power. People like Larry Nasser are obviously evil, but, there are many kinds of evil, many kinds of insanity that cause us to pull over to the side of the road. The confidence of the evil person bowls us over until we become passive. So what chance do us non evil have? If the majority of us will step aside, are we condemned to be run over by the nefarious machinations of those who only care about themselves? I would like to think that we aren’t. You see, people who are evil are fueled by hate. Sometimes it looks like hatred of those they abuse, sometimes it looks like hatred of diversity, of those who are different. All of this, however, is an illusion. What evil really hates is itself. It seems powerful, because it burns hot and loud. It makes noise and knocks people over. However, like a firework, its burning is its destruction. Eventually evil burns itself out. Good, on the other hand, has staying power. It has eternity. Evil focuses on the faults of others. Good focuses on the merits of itself. It plays the long game. When we look at the great movements of history, it is not those that persecute and destroy that endure, it is those that love and accept that remain. Those that are inspired by the mission to build will always outlast those that are condemned by their own self hatred to destroy. So when we feel desperate and powerless against those who will wield power, we need to remind ourselves that it is the good that survive, and it is the evil that eventually wither on the vine. Paul Simon and Art Garfunkel depicted this hero best. 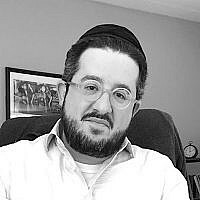 Binyomin Yudin is a psychotherapist in private practice in Cincinnati, Ohio Born in Harrisburg, PA, and raised in Baltimore MD, he attended several yeshivos after high school eventually landing at Ner Israel in Baltimore until his marriage in 2002. He spent several years learning at kollelim in Israel, and after a stint in the rabbinate in St Louis, settled in Cincinnati, OH, with his family.